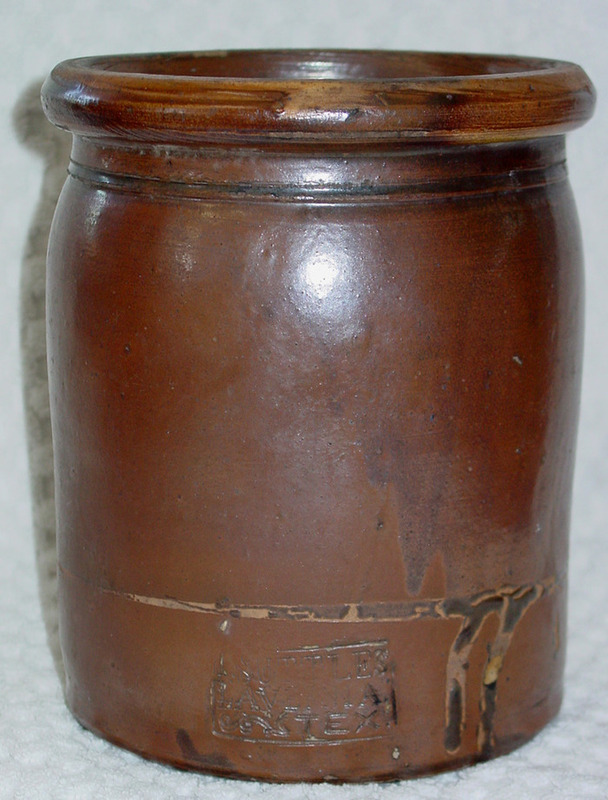 "In the 1870s, two Civil War veterans who were potters from near Zanesville, Ohio came to Texas. They were brothers. One brother was Isaac Suttles; the other, George Washington Suttles. 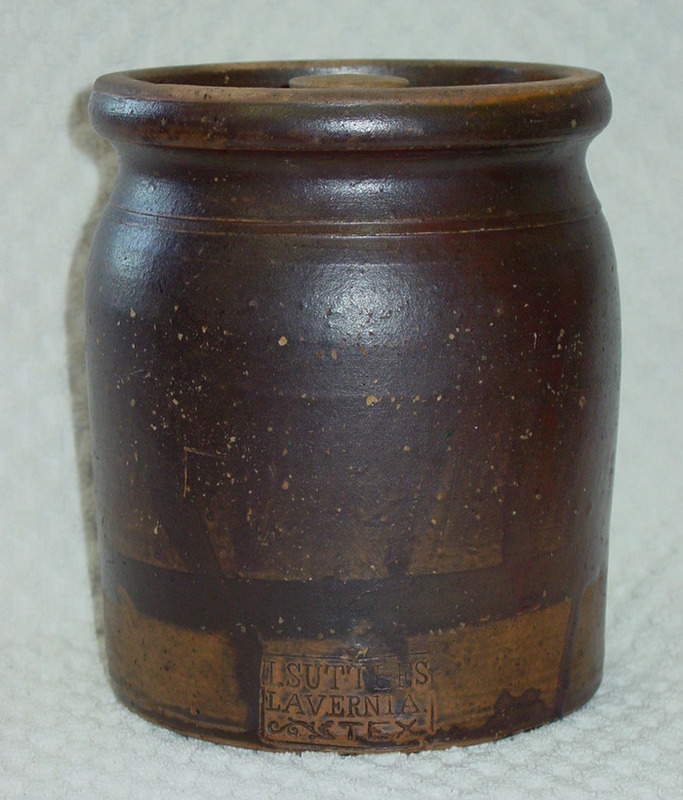 They operated a pottery factory in and around the town of La Vernia, Texas. 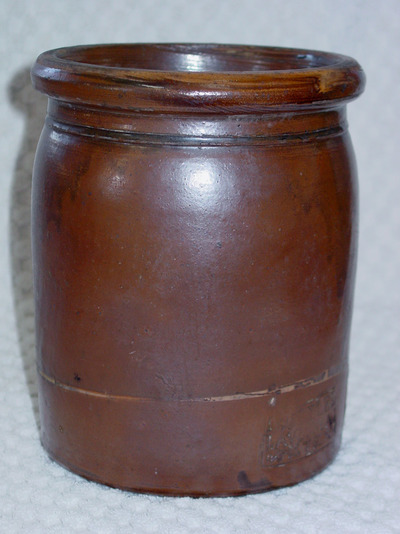 . ."
"George and his brother, Isaac, served in the Union Army during the Civil War. George Washington Suttles joined in the Army in St. Louis, Missouri on April 12, 1865, and served in Company G . . . promoted to Corporal . . ."
"Isaac was in the Union Army also, but for much longer. He enlisted in the U.S. Army Infantry, . . . Ohio Volunteers. . . suffered greatly as a prisoner in the horrible war camp at Andersonville, Georgia." ". . .Suttles was from Ohio, a member of an Irish pottery making family. . .The Wilson Potteries of Seguin was an early business endeavor . . . owned and operated by freed slaves after the Civil War." ". . .He took out an ad in the same paper two months later (August 29, 1878) which read, "Said machine is a dry dirt press, taking the dirt from the bank and forming it into perfect bricks, ready to be set in the kiln. I scraped up the dust on the street and pressed it into a perfect brick. . .The machine is perfect." ". . . George and his wife, Elizabeth, are listed, along with Isaac who is noted as being a member of a Sunday School class, with a perfect attendance record . . . but in 1881. . "
". . .Isaac’s whereabouts are unclear until his death three years later, when he, too, became a ghost." "Isaac Suttles died in Abilene . . . exact cause and date are unknown. It is said that he died during a robbery, but . . ."
"The inventory of his estate lists 2 white shirts, 4 linen collars, 1 pair drawers, . . . 3 white handkerchiefs, . 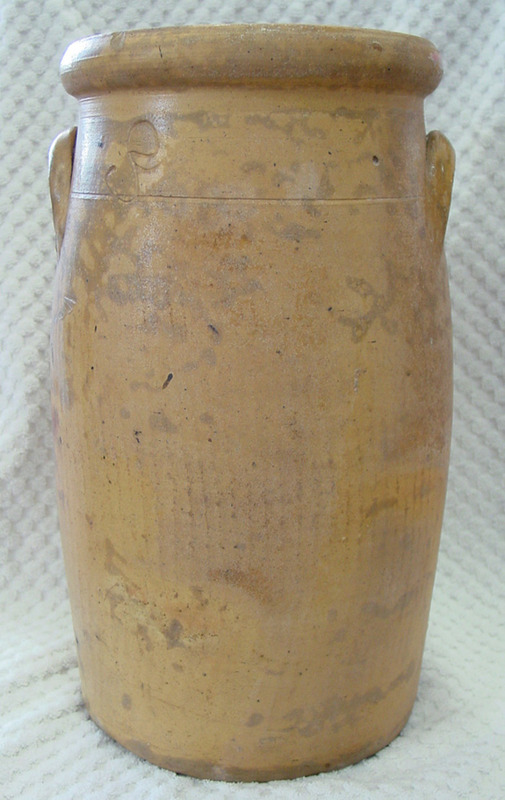 . . 1 Testament, 1 valise, 1 horse brush, 1 shaving mug, 2 vests, . . .
". . .who refused to turn over the "effects in his hand," unless, the new administrator, "pay a claim of $109.00 for his services." ". . . and as such engaged in selling washing machines and wringers .…"
. . ."Please inform us if there is any record of a coroners inquest over the remains of one Isaac Suttles who was found dead . . . He is supposed to have been murdered, as a bullet hole was found through his head." ". . . Isaac’s widow was too poor to pay the $5 and was therefore unable to . . ."
". . . she stated that she, "has not in any manner engaged in or aided or abetted the rebellion in the United States." ". . . No mention of that talent ever appears again. Further descriptions of his occupation list him as a, "soldier" and once as a, . . . a prisoner of war. . . numerous hospitals during the war . . . in a rebel prison. . . reported as missing in action at Atlanta, Georgia. " ". . . born on Halloween . . . five feet eight inches tall, with gray eyes, brown hair and a fair complexion. . . "
"The kilns operated by the Suttles brothers have been a source of mystery. After an extensive search . . ."
". . . Although Georgeanna passed away. . . she left . . .where she found the most . . .in Texas." ". . . seems to have taken five or six days to fire and cool a kiln. Wood was used and it was stoked for one or two days. Mr. Lenz does not remember the act of salting, but remembers that the inside of the kiln was glistening and had drops of glass coming down from the ceiling. 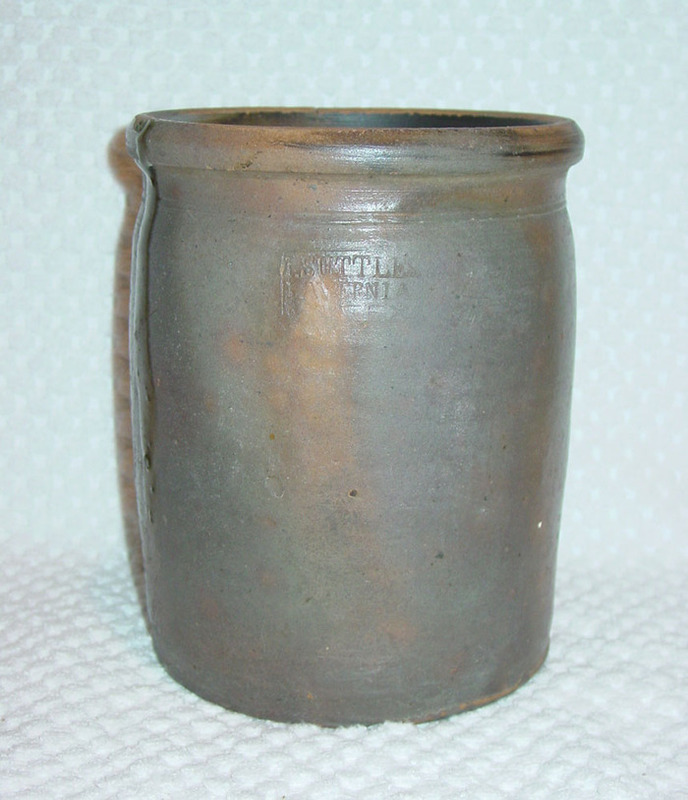 . ."
"Mr. Lenz tells us the story that one day a cow wandered into the pottery shed and knocked over a few things. Mr. Suttles became very angry and picked up pot after pot and threw it at the cow until it left the shed."
. . . "We also recovered a few prehistoric Native American stone tools and debitage, with one diagnostic arrow point, a Scallorn point, dating to the Austin phase of the Late Prehistoric period in Texas, ca. 700 to 1,200 years ago." ". . . .One wonders why the hand which threw so many jars of clay would wither in the end." 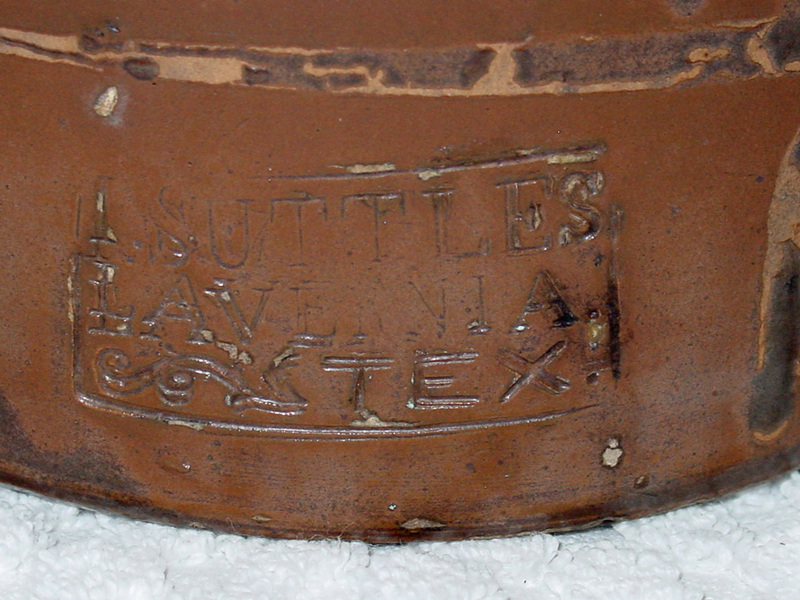 The Suttles Pottery has earned a Texas State Historical Marker which will be dedicated early in 2005.